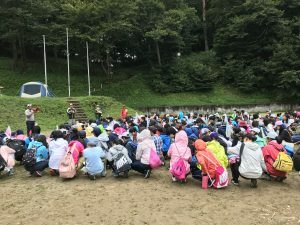 I joined the parent volunteers of the 42nd Meikei Students Satomi Camp held at Satomi Outdoor Activity Center in Hitachiota-shi Ibaraki September 1st (Fri) – 3rd (Sun). 19 mothers and 8 fathers joined as parent volunteers. The main job of the mother team was to deliver the food and clean-up, the father team made the tea and set up the tents. Teachers told the parent volunteers, “let the students think by themselves, and do by themselves. Just keep a safe watch”, parent volunteers were forced to keep patience all the time. The weather changed from cloudy → rainy → unexpected cold → clear sky and so on, as there was a big variation of weather. 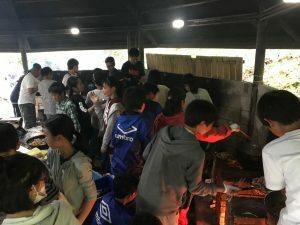 Students cooked each meal by themselves. 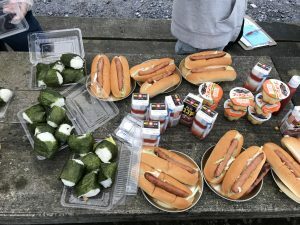 Food materials were provided to each 6 – 7 person groups. Almost all groups faced difficulties to chop firewood with the chopper and light the fire with the matches. The dinner menu was curry and rice. During the dinner preparation time, all the boys in the group I joined suddenly disappeared before I was aware. When they came back, the girls got angry. The boys tried to put the girls back in good humor by say some jokes, but this played off desperately. I broke up into laughter looking at that when I saw the boys, but I impressed the boys used such a high technique trying to help the girls. I didn’t know how the girls felt about the looks it but their curry and rice was so delicious. Since midnight was pretty cold, students woke up shivering. There were some girls coming but couldn’t leave to get warm in front of fire to make tea, or there was a sprightly boy just wearing T-shirts with short pants only. He looked like he was wearing the same T-shirt as yesterday. Readily they started to make breakfast and lunch box. We had hotdogs for breakfast but the bread got wet for some reason. After that, the students departed with their lunchboxes for the orienteering in the light rain. All teams brought a map, however many of them lost the way. When I walked on the trail going back to the right course with these lost teams, I asked them the reason why they were lost, they said they just focused to chase the team in front of them. They never imagined the other team was losing their way. I felt we still needed them to take care, they could easily do the wrong thing. The lunch box was rice balls. The rice itself was so hard, or maybe I should say the rice was not steamed enough. This was the first time I had this type of rice ball. The dinner menu was fried noodles. Since it was the 2nd day, it seemed they learned how to light a fire well. 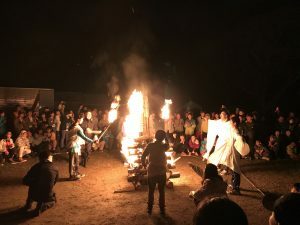 Many teams were able to light the fire soon. 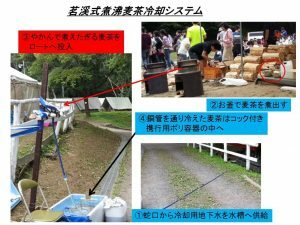 However, some put too much fire wood force of the wind affected the cooking. Some groups had change to the crock pot to cook the Chinese food. In the team I joined, the noodles were a little hard and a little salty. I fell their hard work for cooking the noodles made it really delicious, especially because we walked a lot in day time. I could also spend a fun time chatting with the members having dinner. That helped the meal feel delicious too. After dinner, the camp fire started. The rain was gone but the fire wood was a little wet. The father volunteers poured a little too much oil on the fire wood and that lead us to have some backfire. 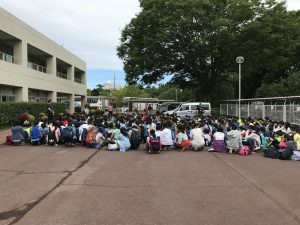 The wind was so strong, so the fire became bigger and sparked one of the students. Immediately all the fathers put out the excess fire. 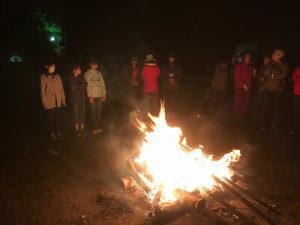 Because of the wonderful father’s team work, we could start the camp fire on time safely. The show started with a student’s song then next was the girl’s dance. They said they practiced during the summer holiday. During the dance, unexpectedly, a few boys came in and started a comedy show. The audience didn’t know but that was produced. They made us laugh very much. 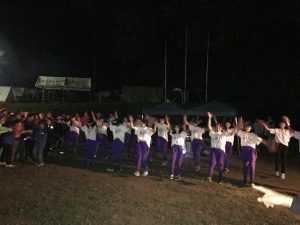 After that, all the students danced Mayim Mayim together, then the fire letters ‘Kizuna’ (bonding) were lit as students sang ‘Yattemiyou’ (let’s try). When we looked up at the sky, it was stadium of stars. Watching the fire slowly vanish, I felt lonely for the days of my youth. It was fine weather from the morning. After breakfast, under the slogan “get cleaner than before”, we started to clean up the baggage, tents, and cookware. Parent volunteers confirmed the number of the returned things and helped load the truck. Teachers told us to confirm everything and try not to have any errors. Students had to count and collect things many times to get everything right. Students couldn’t take a bath, there was no TV, no video games, and on the dark and cold night there was only one blanket each. I thought it must have been a tough and uncomfortable time for them compared to the life they live every day. During those three days, they challenged many hardships and got positive experiences. It was impressive. I could sense their feeling of accomplishment when we came back to school. When I talked to the boys, they were a little more childish than the girls were. They taught me many things and I could talk with them a bit, but for the father who has 2 sons, talking to girls was a bit tough. At the start of the camp, when I talked with them, even jokingly, it was difficult to connect. Eventually, I could talk well with them all the time. I finished the camp days but I still couldn’t understand how to properly talk with the girls. 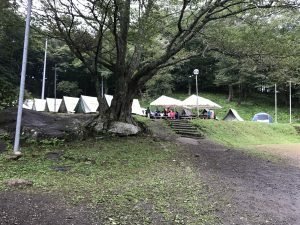 Conversations with my son, who is living in the school dormitory are limited typically, but this from this camp I could understand why he is always saying his school life is full of fun. School life of the 42K students are just started, but looking forward to seeing what they will feel from now on. I deeply appreciated that the teachers planned and executed this camp so professionally. Also, I appreciate the Satomi Outdoor Activity Center staff who welcomed this group and parent volunteers. Personally, I could spend three days regaining senses I forgot, noticing new things, and laughing a lot.